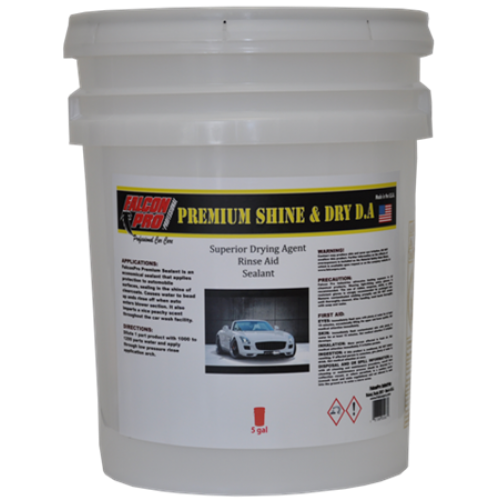 Falcon Pro’s Premium Shine And Dry is a super concentrated rinse aid in all types of car wash facilities. The formulation produces a premium quality shine on all types of vehicle surfaces without smearing or streaking glass surfaces. Use at a dilution up to 1:1200 of product with water in system. Allow roughly 45 seconds prior to rinsing product to see maximum results. For best results apply with hot water to increase performance. Adjust concentration to maintain adequate foam and brush lubrication. Use levels depend on seasonal factors, number of cars being washed, soil type and water quality. Quality of equipment can greatly affect dilution ratio and foam levels.